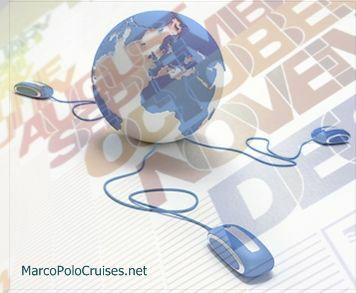 See the list of all ms Marco Polo cruises 2019 and 2020 voyages as itineraries, dates and lowest prices per person. This is a review of Marco Polo cruise ship itinerary and schedule – all departure dates have also CMV’s (Cruise and Maritime’s) cheapest prices to compare. As an old cruise ship, Marco Polo is rich in history and maritime traditions, with its unique small ship charm and beauty. She is also one of the few ocean-going passenger ships able to provide its guests with an unique home-like experience at sea. The cruise ship Marco Polo itinerary program offers regular UK port departures – from England (Tilbury-London,Bristol, Portsmouth),, from Scotland (Leith-Edinburgh), from Wales (Cardiff) and also from Ireland (Cork). This is an “adult only” ship (advertised as “child-free” by CMV). and this is the link to the CruiseandMaritime Voyages official website. Besides all departure dates, this survey also shows suggestive tickets prices Per Person in GBP. These are the CMV official rates (based on double occupancy) showing what are the cheapest fares you can get on Marco Polo deals. Know, that although regularly updated, prices may be different in time of booking. Note: All departures are from the UK (round-trip from Bristol, England). (booking code P908, Apr 19) 3-day “Easter Break Mini Cruise” roundtrip from Bristol (Apr 19) to Ireland (Cork, Apr 20), Isle of Scilly (21), Wales (Cardiff, Apr 22) and back to Bristol (April 22) – prices from £450. (booking code P909, Apr 22) 11-day “British Isles Discovery” roundtrip from Cardiff (Wales) to Isles of Scilly (23), Honfleur (24), Invergordon (26), Kirkwall (27), Lerwick, Shetland (28), Isle of Mull (30), Belfast (May 1), Cork (2) and back to Cardiff, Wales (May 3) – prices from £1630. (booking code P910, May 3) 12-day “Iceland Circumnavigation and Northern Isles” roundtrip from Cardiff (Wales) to Belfast (May 5), Isle of Mull (6), Thorshavn (7), Seydisfjordur (8), Akureyri (9), Isafjord (10), Reykjavik (11), back to Cardiff (May 15) – prices from £1770. (booking code P911, May 15) 4-day “Isles of Scilly and Honfleur” (France short-break” from Cardiff to Isles of Scilly (16), Guernsey (17), Honfleur (18), arriving in Portsmouth (May 19) – prices from £560. (booking code P912, May 19) 13-day “Grand British Isles Discovery” roundtrip from Portsmouth to Newcastle (21), Scrabster (22), Kirkwall (22-23), Lerwick, Shetland (24), Oban (26), Belfast (27), Isle Of Man (28), Dublin (29), Cork (30), Isles of Scilly (31), back to Portsmouth (Jun 1) – prices from £1920. (booking code P913, June 2) 6-day “D Day Anniversary Cruise”roundtrip from Portsmouth to Antwerp, Belgium (Jun 3-4), Honfleur, France (5-6), Rouen, France (6-7), back to Portsmouth (8) – prices from £980. (booking code P914, June 9) 8-day “Rouen Armada and Seine River” roundtrip from Portsmouth to Dublin (Jun 11), Isles of Scilly (12), Guernsey, Channel Islands (13), Rouen, France (14-15), Honfleur, France (16), back to Portsmouth (17) – prices from £1210. (booking code P915, June 17) 12-day “Iceland Circumnavigation and Northern Isles” roundtrip from Portsmouth to Kollafjordur, Faroes (Jun 20), Seydisfjordur, Iceland (21), Akureyri (22), Isafjord (23), Reykjavik (24), Cork (27), back to Portsmouth (29) – prices from £1770. (booking code P916, June 29) 1-day “Weekend Mini Cruise” from Portsmouth to London (Jun 30) – prices from £110. (booking code P950, June 29) 22-day “Arctic and Greenland Voyage” from Portsmouth to London (30), Kirkwall (Jul 2), Thorshavn, Faroes (3), Eskifjordur, Iceland (4), Akureyri, Iceland (5), Tasiilaq, Greenland (7), Narsarsuaq, Greenland (9), Sisimiut, Greenland (11), Kangerlussuaq, Greenland (12), Nuuk, Greenland (13), Qaqortoq, Greenland (14), Reykjavik, Iceland (17), arriving in London (Jul 21) – prices from £3390. (booking code P917, June 30) 21-day “Arctic and Greenland Voyage” roundtrip from London to Kirkwall (Jul 2), Thorshavn, Faroes (3), Eskifjordur, Iceland (4), Akureyri, Iceland (5), Tasiilaq, Greenland (7), Narsarsuaq, Greenland (9), Sisimiut, Greenland (11), Kangerlussuaq, Greenland (12), Nuuk, Greenland (13), Qaqortoq, Greenland (14), Reykjavik, Iceland (17), back to London (Jul 21) – prices from £3250. (booking code P918, July 21) 22-day “Arctic and Greenland Voyage” roundtrip from London to Kirkwall (Jul 23), Reykjavik Iceland (25), Qaqortoq Greenland (28), Narsarsuaq Greenland (29), Sisimiut Greenland (31), Uummannaq Greenland (Aug 1), Ilulissat Greenland (2-3), Qeqertarsuaq Greenland (4), Nanortalik Greenland (6), Lerwick, Shetland (10), back to London (Aug 12) – prices from £3560. (booking code P919, Aug 12) 2-day “Mini Cruise” from London to Rotterdam Holland (Aug 13) and Newcastle (Aug 14) – prices from £260. (booking code P920, Aug 14) 1-day “Mini Cruise” from Newcastle to Edinburgh (Aug 15) – prices from £110. (booking code P922, Aug 18) 5-day “Faroes and Northern Isles” roundtrip from Edinburgh to Kirkwall (Aug 19), Lerwick, Shetland (20), Thorshavn (21), back to Edinburgh (Aug 23) – prices from £780. (booking code P923, Aug 23) 7-day “Summertime Fjordland / Norway Fjords” roundtrip from Edinburgh to Flam (Aug 25), Geiranger (26), Olden (27), Bergen (28), back to Edinburgh (Aug 30) – prices from £1090. (booking code P960, Aug 30) 32-day “Canada / Fall Foliage” from Edinburgh to Newcastle (31), London (Sept 1), Glengariff (3), St Johns NF (8), Halifax NS (10), Charlottetown, Prince Edward Island (12), Gaspe (13), Montreal (15), Quebec City (16-17), Saguenay (18), Baie-Comeau (19), Havre St Pierre (20), Corner Brook NF (21), Magdalene Islands, Quebec (22), Sydney NS (23), Cork (29), arriving in London (Oct 1) – prices from £4170. (booking code P970, Aug 30) 2-day “Weekend Mini Cruise”from Edinburgh to Newcastle (31) and London (Sept 1) – prices from £210. (booking code P925, Aug 30) 1-day “Mini Cruise” from Edinburgh to Newcastle (Aug 31) – prices from £110. (booking code P926, Aug 31) 1-day “Mini Cruise” from Newcastle to London (Sept 1) – prices from £110. (booking code P980, Aug 31) 31-day “Canada / Fall Foliage” from Newcastle to London (Sept 1), Glengariff, Ireland (3), St Johns NF (8), Halifax NS (10), Charlottetown, Prince Edward Island (12), Gaspe (13), Montreal (15), Quebec City (16-17), Saguenay (18), Baie-Comeau (19), Havre St Pierre (20), Corner Brook NF (21), Madeleine Islands, Quebec (22), Sydney NS (23), Cork, Ireland (29), arriving in London (Oct 1) – prices from £4090. (booking code P924, Sept 1) – 30-day “Canada / Fall Foliage” roundtrip from London to Glengariff, Ireland (Sept 3), St Johns NF (8), Halifax NS (10), Charlottetown, Prince Edward Island (12), Gaspe (13), Montreal (15), Quebec City (16-17), Saguenay (18), Baie-Comeau (19), Havre St Pierre (20), Corner Brook NF (21), Magdalene Islands, Quebec (22), Sydney NS (23), Cork (29), back to London (Oct 1) – prices from £3990. (booking code P927, Oct 1) 11-day “Hidden Baltic Treasures” roundtrip from London to Kiel Canal (Oct 2-3), Wismar, Germany (3), Ronne, Sweden (4), Visby, Sweden (5), Riga, Latvia (6), Klaipeda, Lithuania (7), Gdynia, Poland (8), Kiel Canal (passing Oct 10), back to London (Oct 12) – prices from £1650. (booking code P928, Oct 12) 12-day “Iceland Northern Lights” roundtrip from London to Kollafjordur, Faroes (Oct 15), Akureyri, Iceland (17), Reykjavik, Iceland (18-19), Kirkwall (22), back to London (Oct 24) – prices from £1800. (booking code P929, Oct 24) 13-day “Norway Northern Lights” roundtrip from London to Olden, Norway (Oct 27), Kristiansund (28), Alta (30), Honningsvag (31), Tromso (Nov 1), Narvik (2), Bergen (4), back to London (Nov 6) – prices from £1950. (booking code P001, Dec 8) 5-day “French Getaway” roundtrip from Bristol to Rouen France (Dec 10-11), Honfleur France (11), back to Bristol (Dec 13) – prices from £710. (booking code P002, Dec 15) 3-day “Ireland / Dublin Overnight” roundtrip from Bristol to Dublin (Dec 16-17) – prices from £450. (booking code P003, Dec 18) 3-day “Ireland / Dublin and Cobh” roundtrip from Bristol to Dublin (Dec 19) and Cork (20), back to Bristol (Dec 21) – prices from £450. (booking code P004c, Dec 20) 16-day “Madeira and Canary Islands Christmas and New Year Cruise” roundtrip from Cork to Bristol (Dec 21-22), Gibraltar (26), Arrecife (28), Tenerife (29), St Cruz De La Palma (30), Funchal, Madeira Island (31), Lisbon (Jan 2), back to Cork (Jan 5) – prices from £2690. (booking code P004, Dec 22) 15-day “Madeira and Canary Islands New Year Cruise” roundtrip from Bristol to Gibraltar (26), Arrecife (28), Tenerife (29), St Cruz De La Palma (30), Funchal (31), Lisbon (Jan 2), Cork (5), back to Bristol (Jan 6) – prices from £2520. (booking code P005c, Jan 5) 78-day from Ireland “Africa and Indian Ocean Voyage” roundtrip from Cork to Bristol (Jan 6), Lisbon (9), Casablanca Morocco (11), Mindelo Cape Verde (15), St Helena Island (21), Walvis Bay Namibia (25), Luderitz Namibia (26), Cape Town, South Africa (28), Mossel Bay, South Africa (29), Port Elizabeth, South Africa (30), Durban, South Africa (Feb 1), Richard’s Bay, South Africa (2), Saint-Denis, Reunion (6), Port Louis, Mauritius (7), Mayotte, Comoros Islands(10), Zanzibar, Tanzania (12), Mombasa, Kenya (13-14), Mahe, Seychelles (17), Praslin, Seychelles (18), Male, Maldives (22), Colombo, Sri Lanka (24), Cochin, India (26), Mormugao, India (28), Mumbai, India (29), Salalah, Oman (March 4), Safaga, Egypt (9), Aqaba, Jordan (10), Suez Canal (transition on Mar 12), Ashdod, Israel (13 ), Valletta, Malta (16), Gibraltar (19), La Coruna, Spain (21), back to Cork (Mar 23) – prices from £11220. (booking code P005, Jan 6) 78-day from England “Africa and Indian Ocean Voyage” roundtrip from Bristol (January 6 through March 24) – prices from £12000. (booking code P006c, March 23) 14-day “Azores, Madeira and Portuguese Highlights” roundtrip from Cork to Bristol (Apr 24), La Coruna, Spain (26), Horta, Azores (29), Ponta Delgada, Azores (30), Funchal, Madeira Island (Apr 1), Lisbon (3), back to Cork (Apr 6) – prices from £2130. (booking code P006, March 24) 14-day “Azores, Madeira and Portuguese Highlights” roundtrip from Bristol to La Coruna, Spain (26), Horta, Azores (29), Ponta Delgada, Azores (30), Funchal, Madeira Island (Apr 1), Lisbon (3), Cork (6), back to Bristol (Apr 7) – prices from £2130. (booking code P007c, April 6) 7-day “Seine River Easter Cruise” roundtrip from Cork to Bristol (Apr 7), Rouen France (9-10), Honfleur France (10), Guernsey Channel Islands (11), back to Cork (Apr 13) – prices from £1070. (booking code P007, April 7) 7-day “Seine River Easter Cruise” roundtrip from Bristol to Rouen France (Apr 9-10), Honfleur France (10), Guernsey (11), Cork(13), back to Bristol (Apr 14) prices from £1070. (booking code P008c, April 13) 11-day “Treasures of the British Isles” roundtrip from Cork to Bristol (14), Isle of Mull (16), Ullapool (17), Kirkwall (18), Aberdeen (19), Honfleur, France (21), Guernsey Channel Islands (22), Isles of Scilly (23), back to Cork (April 24) – prices from £1760. (booking code P008, April 14) 11-day “Treasures of the British Isles” roundtrip from Bristol to Isle of Mull (16), Ullapool (17), Kirkwall (18), Aberdeen (19), Honfleur, France (21), Guernsey (22), Isles of Scilly (23), Cork (24), back to Bristol (April 25) – prices from £1760. (booking code P009c, April 24) 13-day “Portugal and Spain Fiesta” roundtrip from Cork to Bristol (25), Lisbon (28), Gibraltar (30), Casablanca, Morocco (May 1), Cadiz (2-3), Porto, Portugal (5), back to Cork (May 7) – prices from £2000. (booking code P009, April 25) 13-day “Portugal and Spain Fiesta” roundtrip from Bristol to Lisbon (28), Gibraltar (30), Casablanca, Morocco (May 1), Cadiz (2-3), Porto, Portugal (5), Cork (7), back to Bristol (May 8) -prices from £2000. (booking code P030, May 8) 17-day “Grand British Isles Discovery & River Seine Experience” from Bristol to Portsmouth, visiting Rouen (10), Honfleur (11), Portsmouth (12), Edinburgh (14), Invergordon (15), Kirkwall (16), Lerwick (17), Stornoway (18), Tobermory (19), Belfast (20), Cork (22), Glengariff (23) – prices from £2480. (booking code P010, May 8) 4-day “Springtime River Seine Experience” from Bristol to Portsmouth, visiting Rouen (10), Honfleur (11) – prices from £590. (booking code P011, May 12) 13-day “Grand British Isles Discovery” roundtrip from Portsmouth, visiting Edinburgh (14), Invergordon (15), Kirkwall (16), Lerwick (17), Stornoway (18), Tobermory (19), Belfast (20), Cork (22), Glengariff (23) – prices from £2020. (booking code P012, May 25) 12-day “Hidden Baltic Treasures & Kiel Canal” roundtrip from Portsmouth, visiting Kiel Canal (27), Wismar (28), Ronne (29), Visby (30), Klaipeda (31), Gdynia (Jun 1), Fredericia (3), Kiel Canal (4), Ijmuiden (5) – prices from £1860. (booking code P040, June 6) 17-day “Spitzbergen, North Cape & Land of the Midnight Sun” from Portsmouth to London, visiting London (7), Trondheim (10), Narvik (12), Barentsburg (14), Longyearbyen (15), Honningsvag (17), Alesund (20), Stavanger (21) – prices from £2460. (booking code P013, June 6) 1-day “Overnight Summer Cruise” from Portsmouth to London – prices from £120. (booking code P014, June 7) 16-day “Spitzbergen, North Cape & Land of the Midnight Sun” roundtrip from London, visiting Trondheim (10), Narvik (12), Barentsburg (14), Longyearbyen (15), Honningsvag (17), Alesund (20), Stavanger (21) – prices from £2480. (booking code P015, June 23) 11-day “Hidden Baltic Treasures & Kiel Canal” roundtrip from London, visiting Kiel Canal (24), Wismar (25), Ronne (26), Visby (27), Nynashamn (28), Baltiysk (29), Gdynia (30), Sassnitz (Jul 1), Kiel Canal (02) – prices from £1750. (booking code P016, July 4) 21-day “Arctic & Greenland Expedition Voyage” roundtrip from London to Kirkwall (6), Kollafjordur (7), Eskifjordur (8), Akureyri (9), Tasiilaq (11), Narsarsuaq (13), Sisimiut (15), Kangerlussuaq (16), Nuuk (17), Qaqortoq (18), Reykjavik (21) – prices from £3490. (booking code P050, July 25) 15-day “Baltic Treasures & St Petersburg” from London to Hull, visiting Hull (26), Kiel (28), Kiel Canal (28), Warnemunde (29), Tallinn (31), St Petersburg (Aug 1&2), Helsinki (3), Nynashamn (4), Copenhagen (6), Skagen (7) – prices from £2170. (booking code P017, July 25) 1-day “Weekend Mini Cruise” from London to Hull – prices from £120. (booking code P018, July 26) 14-day “Baltic Treasures & St Petersburg” roundtrip from Hull, visiting Kiel Canal (28), Warnemunde (29), Tallinn (31), St Petersburg (Aug 1&2), Helsinki (3), Nynashamn (4), Copenhagen (6), Skagen (7) – prices from £2170. (booking code P019, August 9) 8-day “Summertime Fjordland” roundtrip from Hull, visiting Eidfjord (11), Flam (12), Geiranger (13), Olden (14), Bergen (15) – prices from £1300. (booking code P020, August 17) 12-day “Iceland, the Land of Ice & Fire” roundtrip from Hull, visiting Thorshavn (19), Eskifjordur (20), Husavik (21), Isafjord (22), Reykjavik (23), Lerwick (26), Invergordon (27) – prices from £1950. (booking code P060, August 17) 13-day “Iceland, the Land of Ice & Fire” from Hull to Newcastle, visiting Thorshavn (19), Eskifjordur (20), Husavik (21), Isafjord (22), Reykjavik (23), Lerwick (26), Invergordon (27), Hull (29) – prices from £1960. (booking code P021, August 29) 1-day “Weekend Mini Cruise” from Hull to Newcastle – prices from £120. (booking code P070, August 29) 12-day “Round Britain & River Seine Experience” from Hull to Newcastle, visiting Newcastle (30), Aberdeen (31), Belfast (Sep 2), Dublin (3), Isles of Scilly (4), Guernsey (5), Portsmouth (6), Rouen (7), Honfleur (8) – prices from £1760. (booking code P022, August 30) 11-day “Round Britain & River Seine Experience” roundtrip from Newcastle, visiting Aberdeen (31), Belfast (Sep 2), Dublin (3), Isles of Scilly (4), Guernsey (5), Portsmouth (6), Rouen (7), Honfleur (8) – prices from £1750. (booking code P022N, August 31) 11-day “Round Britain & River Seine Experience” roundtrip from Aberdeen, visiting Belfast (Sep 2), Dublin (3), Isles of Scilly (4), Guernsey (5), Portsmouth (6), Rouen (7), Honfleur (8), Newcastle (10) – prices from £1750. (booking code P023, Sept 10) – 14-day “Baltic Treasures & St Petersburg” roundtrip from Newcastle to Aberdeen (11), Copenhagen (13), Warnemunde (14), Tallinn (16), St Petersburg (17 &18), Helsinki (19), Nynashamn (20), Aalborg (22) – prices from £2170. (booking code P023N, Sept 11) – 14-day “Baltic Treasures & St Petersburg” roundtrip from Aberdeen to Copenhagen (13), Warnemunde (14), Tallinn (16), St Petersburg (17&18), Helsinki (19), Nynashamn (20), Aalborg (22), Newcastle (24) – prices from £2170. (booking code P024, Sept 24) – 7-day “Autumn Fjordland” roundtrip from Newcastle to Aberdeen (25), Olden (27), Flam (28), Bergen (29) – prices from £1090. (booking code P024N, Sept 25) – 7-day “Autumn Fjordland” roundtrip from Aberdeen, Scotland to Olden (27), Flam (28), Bergen (29), Newcastle (Oct 1) – prices from £1090. (booking code P025, Oct 1) 11-day “Hidden Baltic Treasures” roundtrip from Newcastle to Aberdeen (2), Copenhagen (4), Warnemunde (5), Ronne (6), Visby (7), Klaipeda (8), Gdynia (9) – prices from £1700. (booking code P025N, Oct 2) 11-day “Hidden Baltic Treasures” roundtrip from Aberdeen to Copenhagen (4), Warnemunde (5), Ronne (6), Visby (7), Klaipeda (8), Gdynia (9), Newcastle (12) – prices from £1700. (booking code P026, Oct 12) 11-day “Iceland & Faroes Northern Lights” roundtrip from Newcastle to Aberdeen (13), Lerwick (14), Thorshavn (15), Reykjavik (17&18), Klaksvik (21), Kirkwall (22) – prices from £1700. (booking code P026N, Oct 13) 11-day “Iceland & Faroes Northern Lights” roundtrip from Newcastle to Aberdeen (13), Lerwick (14), Thorshavn (15), Reykjavik (17&18), Klaksvik (21), Kirkwall (22), Newcastle (23) – prices from £1700. (booking code P027, Oct 23) 8-day “South Norway Discovery & Oslo” roundtrip from Newcastle to Aberdeen (24), Oslo (26), Kristiansand (27), Stavanger (28), Bergen (29) – prices from £1180. (booking code P027N, Oct 24) 7-day “South Norway Discovery & Oslo” from Aberdeen to Newcastle, visiting Oslo (26), Kristiansand (27), Stavanger (28), Bergen (29) – prices from £1040. The Marco Polo ship cruise is one of the best reasonably priced choices if you prefer voyages with more intimate, relaxingly stylish and old-time charm travel experiences. On each of your voyages, you’ll be much like an explorer from some distant and more innocent times when travellers like Marco Polo made the history as heralds of a new age of exploration. We wish you happy and safe Marco Polo vacations to completely enjoy your special time on the excitingly adventurous Alexander Pushkin ship!